Fred. 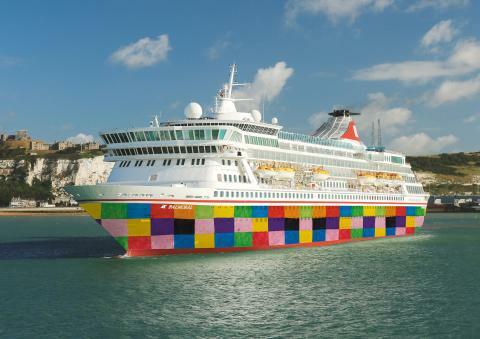 Olsen Cruise Lines has unveiled a bright new patchwork livery on its flagship, Balmoral, to help to raise awareness of a fundraising campaign in aid of Suffolk-based St Elizabeth Hospice – ‘Elmer’s Big Parade Suffolk’. In line with the Fred. Olsen ethos of continual improvement and upgrading of its fleet, Balmoral has been adorned with an eye-catching new patchwork livery. The vibrant pattern was chosen by Peter Deer, Commercial Director for Fred. Olsen Cruise Lines, to reflect the cruise line’s support of the ‘Elmer’s Big Parade Suffolk’ campaign, based around the children’s picture book character, ‘Elmer the Patchwork Elephant’, created by David McKee. The ‘Elmer’s Big Parade Suffolk’ art project – to raise funds for Ipswich’s St Elizabeth Hospice – will be bringing 55 large Elmer sculptures and 85 ‘young Elmers’ to the county town in Summer 2019, and follows on from the hugely successful ‘Pigs Gone Wild’ trail in 2016. The Parade is once again being run in conjunction with public art event specialists, Wild in Art, and new partner, Andersen Press, who have published ‘Elmer’ for 30 years. Starting with its flagship, Balmoral, the unique patchwork design will be rolled out across Fred. 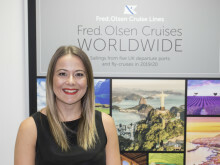 Olsen’s three other ocean ships – Braemar, Boudicca and Black Watch – over the coming months. Fred. Olsen has commissioned its own ‘top secret’ sculpture for the campaign, designed by talented Trimley artist, Angela Ashford. The ‘big reveal’ of Fred. Olsen’s design will take place when the ‘Elmer’s Big Parade Suffolk’ art trail gets under way officially on 15th June 2019. “St Elizabeth Hospice provides a vital service within our community, and has provided invaluable support to many of our colleagues and their families over the years, so we are so proud to be supporting ‘Elmer’s Big Parade Suffolk’ as our major local charity campaign in 2019. “We were thrilled to get Fred. Olsen on board with our campaign as a sponsor over a year ago and we have been so impressed how they have really gone above and beyond in their efforts to be really involved in the campaign; from holding fundraising events at their headquarters in Ipswich, to involving our ‘Patchwork Elmer sculpture’ in all sorts of different events, and now even referencing us in the rebranding of their ships – it really is amazing. “In Elmer's 30th anniversary year, we want to turn the whole country patchwork in celebration, but to work with St Elizabeth Hospice and Fred. Olsen to turn the high seas patchwork is truly beyond anything we imagined. Here’s hoping this beautiful patchwork livery raises lots and lots of money for the Hospice, and spreads a message of friendship and acceptance in each port of call!" ‘Elmer’s Big Parade Suffolk’ marks the 30th anniversary since the first book on Elmer’s adventures was published by Andersen Press, with St Elizabeth Hospice also celebrating its 30th anniversary in 2019. Fred. Olsen celebrated 30 years of being headquartered in Ipswich, Suffolk in 2018. Elmer’s Big Parade Suffolk will take place between June and September 2019 raising much needed funds for the vital work of St Elizabeth Hospice. £200,000 pays for approximately one week’s care. St Elizabeth Hospice improves life for people living with a progressive or terminal illness. Our work is centred on an individual's needs, which means specialist support, whenever and wherever it is needed, whether at home, in the community or at the hospice. Through medicine and therapy we ease pain; we give life purpose and make life liveable. Since 2008 Wild in Art has animated cities across the world including Sydney, Melbourne, Cape Town and São Paulo, and created trails for the London 2012 Olympics, the 2014 Commonwealth Games in Glasgow, Historic Royal Palaces and Penguin Random House. Andersen Press is a leading independent children’s publisher, and home to some of the biggest names in the world of children’s books, including the much-loved picture book characters Elmer the Patchwork Elephant and the Little Princess. Andersen Press is the publisher of many award-winning authors and illustrators including Melvin Burgess, Rebecca Stead, Susin Nielsen, Julian Clary, David Roberts, Tony Ross, David McKee, and Jeanne Willis. The company was founded in 1976 by Klaus Flugge. Elmer remains one of the most iconic and widely read children’s book series of all time, selling over 8 million copies worldwide since it was first published by Andersen Press in 1989. Written and illustrated by celebrated children’s author and artist David McKee, the Elmer books have been translated into more than 50 languages with toys and clothing adding to the world of Elmer the Patchwork Elephant. Since the first Elmer title debuted in 1989, Andersen Press has developed an internationally successful Elmer publishing programme which spans over 24 original stories and includes board books, activity books and novelty books. A beloved classic and firm family favourite, David McKee’s iconic and brightly coloured patchwork elephant has also inspired a branded merchandise programme which has proven success at retail and is popular in millions of households across the world.